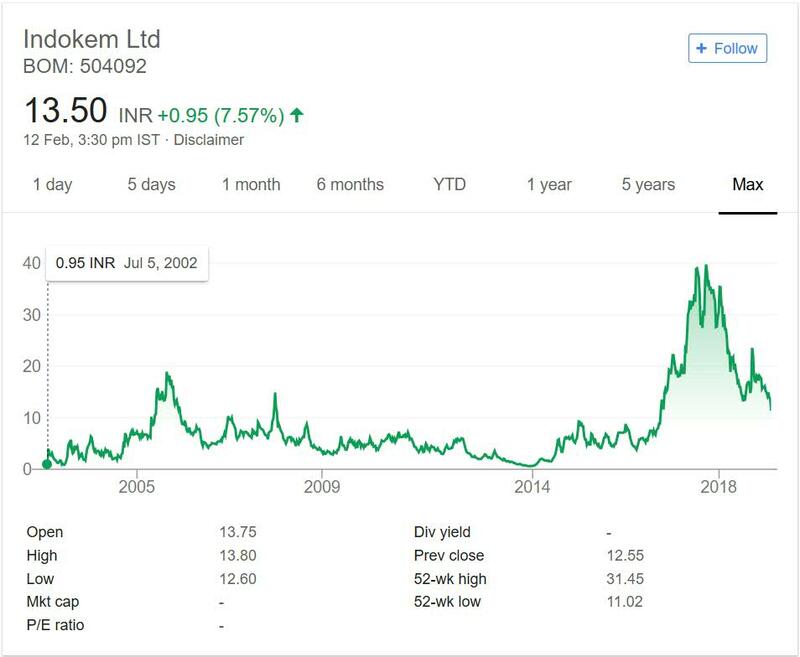 Indokem Ltd. is in portfolio of Subramanian P. He is one of the top investors in India. The company belongs to Chemicals sector. It has two factories one at Ankleshwar Gujarat and other one in Mumbai. Both of them produce different line of products. As per Company website it helped them increase productivity and efficiency. The long term chart can be divided into two parts. One from year 2002 to 2014 and other from 2014 to now. In first part it moved up from 2002 to 2006 giving close to 20 times return. After in next 8 years it wiped off all the gains and traded at 2002 levels. During last few years it gave 40 times return and then prices came down sharply from 40 levels to 15 levels making the returns close to 14 times. It is healthy return but the drastic price movements makes investors nervous. Indokem Limited is again from Chemicals sector. As mentioned in previous articles Subramanian P has quite a few companies from Chemicals sector in his portfolio. This is growth sector and few companies have given multi bagger returns in past. The past performance was decent but the erratic price movements is not good for investors. I personally dislike companies having swift movement in either direction. If it falls freely then all of your gain can get diminished in short period of time. I am already invested in Chemicals sector. Also textiles industry itself is struggling. As it serves textile industry I do not see much potential. I would rather choose not to invest in this counter as there are much safer investment option available in this sector.